I am officially address-less (homeless seems in accurate) after moving out of my house. I managed to move out of my residence of 4 years in the span of 2 weeks. It seemed impossible while working full time and while suffering from a sinus infection. Bad timing was an understatement but I had a task and goal so I made it happen, amazingly smooth if I may toot my own horn a bit. I am very grateful that I was able to have movers, friends, and family help me condense my life into a POD. After selling, donating, and purging the items without value I have closed the chapter on my first home. The house is sold and in the hands of a lovely new owner (I hope she treats you well sir). This means I'm now on the hunt for a new place to lay my head. Thank you to those that offered me space, celebrated my life change, and helped me make my crazy deadlines!!!! In the course of uprooting my former life, I also managed to have some major work accomplishments. I presented then facilitated round tables at a major national conference, I premiered an amazing product, I’m approved to move forward on a major production project, and I received kudos from my leadership. The actual joy inside me is sitting right below the surface of exhaustion (I promise). Despite the euphoria, the indefinite guest room crashing, and the chaos of living out of suitcases my mind immediately went to, what next. Hustle hard is a motto I have lived by for a long time but I didn't realize how ingrained it was in my mind. I was immediately thinking on to the next, but my hustle has changed over the years. I am more and more focused on the greater good (mainly for my family) and I realized my heart was driving my thoughts. My passion and motivation for changing my/the world (macro and micro level) is on 1000. I want to do more! I want to work harder! I want my hustle to benefit my nephew and nieces. 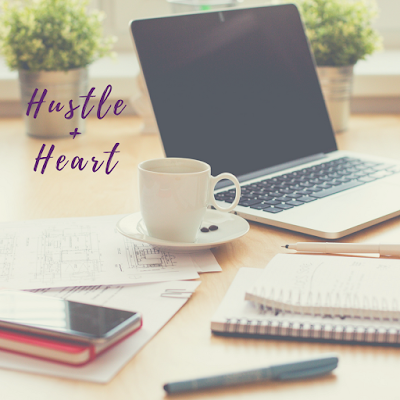 So my new motto is hustle +heart and today I'm embracing that!!! So this hustler with heart is about to shake some things up! Happy Monday!